The First Siege of Rome during the Gothic War lasted for a year and nine days, from 2 March 537 to 12 March 538. The city was besieged by the Ostrogothic army under their king Vitiges; the defending East Romans were commanded by Belisarius, one of the most famous and successful Roman generals. The siege was the first major encounter between the forces of the two opponents, and played a decisive role in the subsequent development of the war. Dialogue between Belisarius and the Gothic embassy Procopius, De Bello Gothico II. Nevertheless, a three-month armistice was arranged in order for Gothic envoys to travel to Constantinople for negotiations. Belisarius took advantage of it and brought the 3,000 Isaurians, who had landed at Ostia, along with a large amount of supplies, safely to Rome. During the armistice, the Goths’ situation deteriorated for want of supplies, and they were forced to abandon the Portus, which was promptly occupied by an Isaurian garrison, as well as the city of Centumcellae (modern Civitavecchia) and Albano. Thus, by the end of December, the Goths were virtually surrounded by Roman detachments, and their supply routes effectively cut. The Goths protested these actions, but to no avail. Belisarius even sent one of his best generals, John, with 2,000 men towards Picenum, with orders to avoid conflict but, when ordered to move, to capture or plunder any stronghold he met, and not to leave any enemy strongholds in his real. Shortly thereafter the truce was irretrievably broken by the Goths, when they attempted to enter the city in secret. First they tried to do so by using the Aqua Virgo aqueduct. Unfortunately for them, the torches they used to explore it were detected by a guard on the nearby Pincian Gate. The aqueduct was put under close guard, and the Goths, perceiving this, made no attempt to use it again. A little later, a sudden attack against the same gate was repulsed by the guards under the command of Ildiger, Antonina‘s son-in-law. Later, with the aid of two paid Roman agents, they tried to drug the guards at a section of the walls near St Peter’s and enter the city unopposed, but one of the agents revealed the plan to Belisarius, and this attempt too was thwarted. In retaliation, Belisarius ordered John to move on Picenum. John, after defeating a Gothic force under Ulithus, an uncle of Vitiges, was free to roam the province at will. However, he disobeyed Belisarius’ instructions, and did not attempt to take the fortified towns of Auxinum (modern Osimo) and Urbinum (modern Urbino), judging that they were too strong. Instead, he bypassed them and headed for Ariminum (Rimini), invited there by the local Roman population. Ariminum’s capture meant that the Romans had effectively cut Italy in two, but in addition, the city was barely a day’s march away from the Gothic capital of Ravenna. Thus, at the news of Ariminum’s fall, Vitiges decided to withdraw in all haste towards his capital. 374 days after the siege had begun, the Goths burned their camps and abandoned Rome, marching northeast along the Via Flaminia. But Belisarius led out his forces, and waited until half the Gothic army had crossed the Milvian Bridge before attacking the remainder. After initially fierce resistance, the Goths finally broke, and many were slain or drowned in the river. After their victory over a numerically much superior enemy, the Romans gained the upper hand. Reinforcements under Narses arrived, which enabled Belisarius to take several Gothic strongholds and control most of Italy south of the River Po by the end of 539. Eventually, Ravenna itself was taken by deceit in May 540, and the war seemed to be effectively over. However, very soon, the Goths, under the capable leadership of their new king Totila, managed to reverse the situation, until the Empire’s position in Italy almost collapsed. 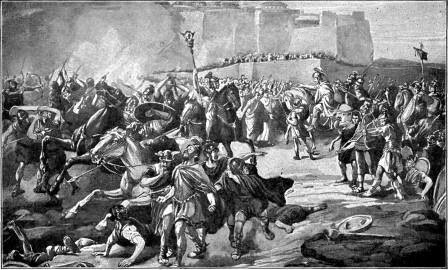 In 546, Rome was again besieged by Totila, and this time Belisarius was unable to prevent its fall. The city was reoccupied by the Imperials soon after, and Totila had to besiege it again in 549. Despite the city’s fall, Totila’s triumph was to be brief. The arrival of Narses in 551 spelled the beginning of the end for the Goths, and in the Battle of Taginae in 552 the Goths were routed and Totila was killed. In 553 the last Ostrogothic king, Teia, was defeated. Although several cities in the north continued resistance up to the early 560s, Gothic power was broken for good.